The only case of independent success in the entourage close to the Emperor. Bernadotte, which one called Sergent Beautiful-Leg, is the single marshal who crosses the Revolution and the Empire to finish on a throne! This lawyer wire enrôle in the royal army in 1780. It is the Revolution and the war with Austria which enable him to become officer. Kléber names him sergeant general. In 1797, Bernadotte leaves the Army of the Rhine to give his support for Bonaparte to Italy.After the peace of Campoformio, Bonaparte gives him a command subordinate. The Directory entrusts to him a short mission of ambassador in Vienna then appoints him Minister of the War from July to September 1799. Bernadotte reorganizes the army, then badly in point, but the Directors end up drawing aside him. His antipathy for Bonaparte becomes manifest. He refuses to engage frankly in the strike of State of the 18-Brumaire, which is worth a reputation of néo-Jacobin to him. Become controlling Army of the West, his name is mixed with the conspiracy with «the pots with butter»(in which circulated of the tickets anti-Bonapartists). Moreover, he marries Désirée Clary, formerly been engaged to Bonaparte, now sister-in-law of Joseph.He becomes marshal in 1804 and prince of Laying-Corvo two years later, although there remains discrete in the great battles, as in Austerlitz for example (December 2, 1805). At the time of the double battle of Auerstadt and Iéna, October 14, 1806, Bernadotte, which has the role of supporting the body of Davout to the catches with the large one of the Prussian army, awaits the evening to move! Napoleon does not seem to hold rigour of it to him.On the other hand, when it is a question of continuing the remainders of the Prussian army, he fits the boots of seven miles to traverse all Prussia from the south in north. After having forced the Prussians of Blücher to capitulate in open country, he treats the officers of Swedish division made captive with Lübeck with courtesy and respect. 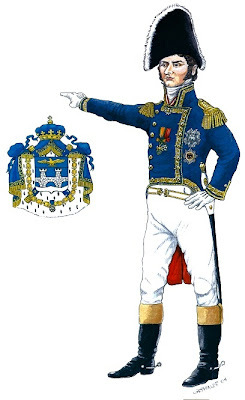 This behavior, specimen with the eyes of the Diet of Stockholm, as well as the desire of Sweden to approach France to counter Russia, has an unexpected consequence: August 21, 1810, the States General of Œretro choose this French marshal as hereditary prince of Sweden. Napoleon will not oppose it, would be this only because one French marshal on the throne of Gustave-Adolphe is one of the prettiest turns played in England.For the moment, he still fights under the commands of Napoleon. It is during the campaign of Poland, in 1807, that he shows his best control of the command. He folds up brilliant manner towards the Russian armies of Benningsen, making it possible to Napoleon to engage the maneuver of Eylau (February 8, 1807). On the other hand, his body takes part neither in this last battle, nor with that of Friedland (June 14, 1807). Bernadotte is finally relieved by the Emperor for control of the Saxon body of which he has the command at the time of the battle of Wagram (July 5-6, 1809). His body does not manage to take the Prussian lines and is folded up in rout at the time of the first day of the battle (July 5). The following day, whereas the forces under the command of Napoleon are victorious, he launches an eulogistic proclamation to his troops, which had relaxed the day before.Bernadotte, called near the Swedish throne, August 21, 1810, cherished by Charles XIII, appears a true Swedish. He abjures Catholicism and takes with care the businesses of his future kingdom. The interests of his new fatherland run up against those of France. If Bernadotte yields initially to the injunctions of Napoleon and declares the war in England, he reconsiders his decision since 1812 and signs an alliance with the tsar, Alexandre 1st. In 1813, Sweden enters in the coalition against France. Bernadotte brings an army of 30 000 men and his knowledge of the napoleonian tactics . His army beats Oudinot at Gross-Beeren (August 23, 1813) and Ney at Dennewitz (September 6, 1813). In Leipzig (October 16-19, 1813), he once again shows good maneuver, but avoids directly crossing iron with his rival. At the time of the campaign of France, in 1814, Bernadotte controls the Army of North. He invades his old fatherland while passing by Holland and Belgium. Without being determining, his role was very significant in the rout of the French Army. Some speak about him like future king of France. It will not be the case, but he obtains Norway, January 14, 1814, in reward of his services. February 5, 1818, he succeeds Charles XIII, under the name of Charles XIV, king of Sweden and of Norway. He is the ancestor many monarchs who reign today still in Sweden in Norway, but also in Luxembourg, in Belgium and in Denmark. Beautiful course for the former republican sergeant Beautiful-Leg, which one says that he carried on the chest Mort «tattooing to the kings»! Jean Baptiste Jules Bernadotte. This rare uniform of Republican style is reprised from a portrait executed in 1807, already in the Imperial period, out of spite to Napoleon, cordially hated. Bernadotte would represent his love for Republican period and democracy, because he did not want an Emperor and his power. Owing to his contrast with Napoleon, when the Kingdom of Sweden, allied with France after some years of wars, asked to Napoleon for an heir for his old King Charles XIII, after the death of the crown Prince, Napoleon was very happy to send away Bernadotte. But he became King, with the name of Charles XIV, and betrayed his Country, entering in war during the campaign of 1813 with the Coalison against Napoleon and France. It' s the first every now I take heard that in Macedonia, obits are an unusual observe. You maintain wonderfully written the post. I accept liked your way of poetry this. Thanks in behalf of sharing this.